A little less consumption, simpler wants and some respect for nature - then maybe, just maybe, we will start to fix our planet's problems. 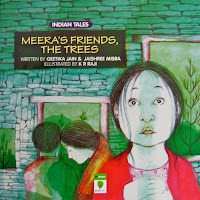 This is the message conveyed in Meera's Friends, The Trees. Without actually saying it, it tells the young reader that trees are not inanimate objects, they are caring providers that ought to be respected in return. Little Meera lives in a village at the foothills of the Himalayas. She does not go to school like city children but learns everything from Mother Nature. She runs free among the murmuring whispering trees in the forest and loves them most of all. Every tree is special to her - the old gnarled one with a comfortable lap is the Naani tree, another is a Devi tree which is revered by all the villagers, then there is the little Chottu tree. She understands how the trees not just provide food and a means of livelihood but also save the land by holding it tight with their roots. One day Meera hears of a terrible thing - that the city people will come with government papers that allow them to chop and clear the forests. She cannot believe her ears. Her mother tries to console her and explains that wood is needed by the city folks to build their houses and furniture and that they did not 'live with little, like the village folks'. The next day the people arrive with their cutting machines. The villagers plead with them in vain to abandon their plans. They resign themselves to their fate, what after all can they do against such powerful people? Meera however cannot bear the thought of her beloved Naani tree being cut down and runs past everyone to her favourite place. She clings to her tree and refuses to budge. The rest of the villagers do what she is doing and hug a tree each. To cut the tree, the axe would have to hack through its human protector. The city folks finally relent and leave. The story has been inspired by the Chipko movement, in which the peasant folks of Uttaranchal saved their trees from being cut down. It became 'a turning point in the history of eco-development struggles in the region and also across the world'. Read more about the movement here. Sounds like a really wonderful book. Reminds me of 'The Lorax' by Dr. Seuss. Recently we saw a series of books called Eco-worries. A got a book from these series called 'Tree Trouble'. It is about two schoolgirls who learn about the destruction of rainforests in school and decide to do their bit to help. The chapters are interspersed with nuggets of information about what can be done by everyone. A few years back we had rented a movie in the US called 'Family Tree'. It was about a small town where a plot of land is to be developed into a residential area. There is a very old oak tree bang in the centre which needs to be cut down. The story tells us about a teenager who loves this tree on which he has played since a child, and how he convinces the entire community to work around the tree in the face of many odds. (Read community pressure, parental pressure and coercion by those with monetary interests in the project) It was a lovely movie.I tried getting it some time ago, but could not find it. Certainly worth a watch. Sandhya: We have one more lovely book about trees by Ruskin Bond called 'The World of Trees' (NBT Publications). Has absolutely gorgeous illustrations by Kallol Majumdar. Lets swap the books for the kids to read, what say? mmm..mmm..oh, we love that song chox! Love trees that portray a child's connection with nature - tress, seas, or animals. 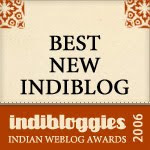 This particular story is very similar to (Tulika's) Nina Sabnani's "Best Friends" reviewed here : http://www.saffrontree.org/2009/04/best-friends-for-earth-day.html. Wonderful pick Chox ! Where did you get this book ? I like the idea that it is based on the chipko movement. Ranjani: From a DC Books outlet. Check it out. Lovely pick - the Chipko movement is so inspiring isn't it? Where is the DC books outlet. And you must let us into the secret - how do you find so many fabulous books? Poppy: Totally. Shows that what Gandhi (and others before/after him) preached is not out-dated, it is in fact the need of the hour. Where is the outlet? - They have several across the city - incl. one in Jayanagar. KaradiTales: Thanks for stopping by! OMG, some sort of synchronicity - we read The Kapok Tree (Lynne Cherry), similar theme, different approach, and yes, like Praba, it reminded me of The Lorax who speaks for the trees ans the trees have no tongues!